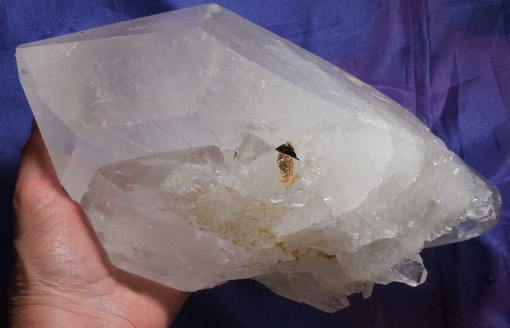 This is a wonderful 8 lb 13.6 oz, 9.6" by 5.2" by 4.3" DT quartz from Montas Claros, Brazil. He is a large single point, bridged with a side of amazing tabby students and loads of others at his multi-terminated lower termination that frames a glittery crystal cave, filled with druse. His sides are graced with Lemurian lines, blended with assorted starbrary glyphs making him a sort of universal (in the grandest interpretation of the word) communicator. He is lightly misted inside with rainbows, particularly between the crystals and overall, he looks like a rocket ship. Awesome glyphs feature on his faces (including tiny trigonic record keepers) and he has elestial insets ... he glistens, gleans and dazzles all at once! And I am fascinated by his icy appearance ... he is truly magnificent! He has a ding or so, but is still is in excellent condition with much information to share with a Keeper who has or suspects Star roots ... he would make an excellent addition to you special starbrary altars or other altar spaces. Starbraries are recognized by the presence of glyph-like markings, symbols and geometric patterns plus usually a doorway or key. By aligning fingers with the doorways or keys, you can unlock different layers, depending on orientation. Companion crystals are important - they either come with the crystal (purchased with or given with) or appear shortly thereafter. They don't have to be quartz, but work with the main crystal to unlock different layers or even gain access to the crystal itself. All Starbraries work like that - the companions facilitate access, although it's possible to gain access just from the Starbrary itself. There are at least 6 different peoples who left crystal records. The most sought after are the maps, histories and legends of the people of the Cassiopeia system. They are recognized by more flowing lines and symbols along the sides of the crystal. While they often manifest key markings, they don't always, but there will always be different and comfortable ways to hold the crystal, facilitating the opening of the many layers. These are the most detailed crystals and contain HUGE amounts of information - like encyclopedias, although even more in depth. All of the Starbrary formations hold information of peoples who had a positive influence on human growth and evolution. The records were left here so that in the event of catastrophe, there would be a permanent record to help Earth rebuild. Starbraries were placed in many locations so the records could be accessed by peoples all over the world. There are sets of crystals - like chapters or series. When one comes to you, all of a sudden, you will find many more. It is important to ask the order to read them. Click on the link below to see additional information.